The 10th Annual West of Ireland Women's Mini Marathon will take place on Sunday May 5th 2019 at 12noon in Castlebar. Keep your eye on this website over the next number of weeks for further announcements. ​The Western People West of Ireland Women’s Mini-Marathon, widely regarded as one of the preeminent road races in the region, will this year celebrate its tenth anniversary. The Mini-Marathon, which will take place in Castlebar on Sunday, May 6 in conjunction with the Mayo Sports Partnership and Mayo.ie, was officially launched in the Mall this week and is currently inviting registrations for what promises to a fantastic event in two months’ time. Since its inauguration in 2010, the Mini-Marathon has grown to become one of the biggest events of its kind in the West of Ireland. Over the previous nine stagings of the race, a combined 25,000 participants, including 4000 children, have taken part in the event. The Mini-Marathon has had an estimated value of over €2.5 million to the economy of Castlebar and has raised in excess of €1 million for its charity partners. Representatives from Mayo County Council, the Mayo Sports Partnership, Mayo.ie and the Western People were on hand for the official launch of the 2019 Mini-Marathon, an event which promotes the importance of physical exercise and encourages girls and women to participate in sport. The winner of last year’s Mini-Marathon, Regina Casey, was also present for the launch. The event is regarded as the foremost event of its kind in the region and has drawn praise over the last decade for its efforts to promote women’s involvement in sport. Both Mayo County Council and the Mayo Sports Partnership are steadfast in their support of an increased level of participation in sport among girls and women of all ages. The physical, mental and social benefits of taking part in any and all kinds of sports are well-documented and the Mini-Marathon is one of the centre piece events of the county’s sporting calendar. The Mini-Marathon s being held to coincide with Mayo Day 2019, the festival which celebrates all that is good about the county, its culture and its people. The race is also on the same day as the mayo senior footballer’s Connacht Championship opener against New York, which will take place that evening, 7pm Irish time. The tenth anniversary staging of the race will also see the return of the ever-popular ‘Mini-Mini’, the 2k race for young runners, boys and girls, which will set off before the main race and give youngsters the chance to get involved in the day’s activities while also encouraging their physical fitness and well-being. The Mini-Marathon will also see the return of the ‘It’s for Girls’ schools initiative, which aims to encourage groups of students and teachers from schools around Mayo and the wider western region to train and take part in the race collectively, with prizes on offer for the school with the biggest representation on the day. 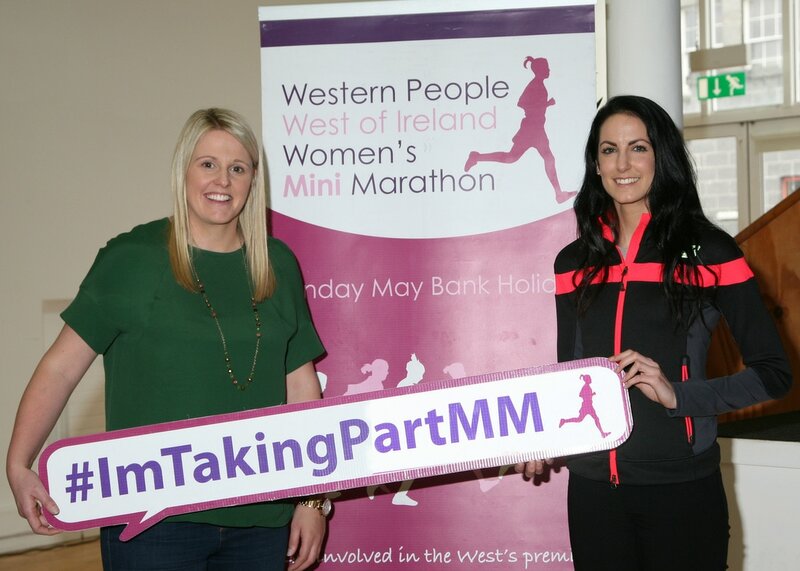 Irish international athlete Jessie Barr was among the speakers at the recent Girls and Women in Sport seminar in GMIT Castlebar — at which the eighth annual Western People West of Ireland Mini-Marathon was officially launched. speak to the crowd of hundreds, comprised primarily of female students from schools around Mayo, about girls in sport, the challenges they face and why, in stark comparison to their male counterparts, girls tend to drop out of sport in such numbers in their teenage years. Barr said that young girls were facing undue pressures — from society at large, and from their own peer groups —to turn their backs on sport. She told the story of her own teenage years, as a secondary school pupil, and how she often felt close to packing in her own sporting activities, especially when the friends and teammates she had grown up training and competing with began to drop away. competition — but emphasized how delighted and grateful she is as an adult that she stuck with sport in her teens. reaping the benefits in terms of physical and mental health, pushing oneself to achieve and making friends along the way. Barr was talented enough, and fortunate enough, to progress all the way to the Olympic Games. And, despite her recent injury travails, it was easy to see how much she still enjoys training and competing as an elite athlete. Not every young girl considering taking up a sport, or thinking about leaving a sport behind, will go that far. For most, sport is something to be embraced and enjoyed; girls should be allowed an encouraged to do just that. It was a star-studded line up of some of Ireland’s leading sportspeople that congregated in GMIT Castlebar on Thursday morning last the 8th February for the Girls and Women in Sport seminar, hosted by the Mayo Sports Partnership. The seminar was also the setting for the official launch of the 2017 western people West of Ireland Women’s Mini-Marathon. The Mini-Marathon, which this year takes place on Sunday, April 30 from The Mall in Castlebar, is now into it’s eighth year and has raised over €1.7million for local and national charities to date. This year’s event, which is being organised by the mayo Sports Partnership in partnership with the Western People and Mayo.ie, is expected to be the biggest and best yet. Over 3,500 runners, joggers and walkers took part in the race in 2016 and organizers are confident of that number rising yet again this year. The event follows a 10k route around the county town and participants are encouraged to take part at their own pace. Runners who have taken part in the mini-marathon in recent years include Irish athletic legend Sonia O’Sullivan, Irish Olympian Lizzie Lee and Belmullet native Sinead Diver, who returned mayo from her adoptive Melbourne to take part in the race. There was a similarly stellar cast of female sporting talent at the launch of the 2017 Mini-Marathon this week. Try this for a roll-call: Irish Olympic hurdler Jessie Barr, Irish Paralympic swimmer Ellen Keane, international canoeist Jenny Egan, Mayo ladies football great Cora Staunton and RTE Sport anchor Jacqui Hurley. They were all in town to take part in the Girls and Women in Sport seminar, which aimed to encourage more girls to play a more active role in all kinds of sport. Over 300 girls from schools around the county journeyed to GMIT to gain the insights of some of Ireland’s greatest female athletes, hearing their stories of success and listening to the difficulties they had to face along the way.